Our new Christmas cards are now available! This year we collaborated with local artist Meghan Schultz to create three beautiful new designs. Meghan’s background is in graphic design and advertising with a special interest in fine art and calligraphy. While busy as a homeschooling mother, she finds time to pursue art as a personal hobby and also to create liturgical artwork for her home congregation, Redeemer Lutheran Church – Fort Wayne. Meghan recently designed a coat of arms for Redeemer, which was then rendered in hand-carved wood, and she’s currently working on several custom projects. 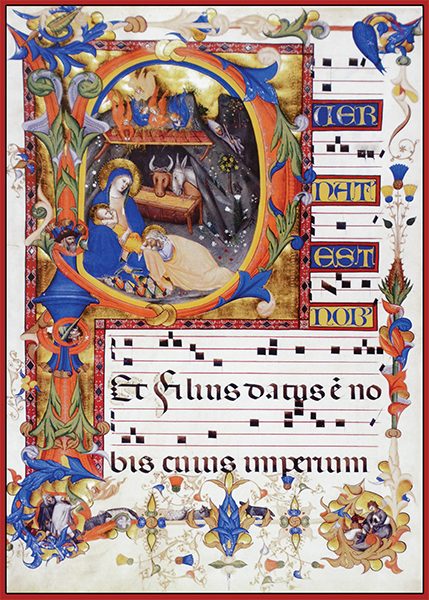 The illuminated artwork for “A Child is Born” (right) is from a 14th-century choir book from a monastery in Italy. The words on the manuscript in Latin are from Isaiah 9:6, which is also quoted in the inside greeting: “For to us a child is born, to us a son is given…” You can view the inside text in its entirety on our Christmas cards page. Finally, we decided to redesign one of the very first Christmas cards that we introduced back in 2011. The artwork for “Nativity” (left) is a fresco from the Imperial Cathedral in Speyer, Germany. This Nazarene-style fresco was painted in the cathedral’s interior walls in the mid-1800s by Johann von Schraudolph at the behest of King Ludwig I of Bavaria. The city of Speyer is significant in Reformation history; adherents of the Reformation were first called Protestants when they protested the Holy Roman Empire’s ban against Martin Luther and his teachings at an Imperial Diet in Speyer in 1529. 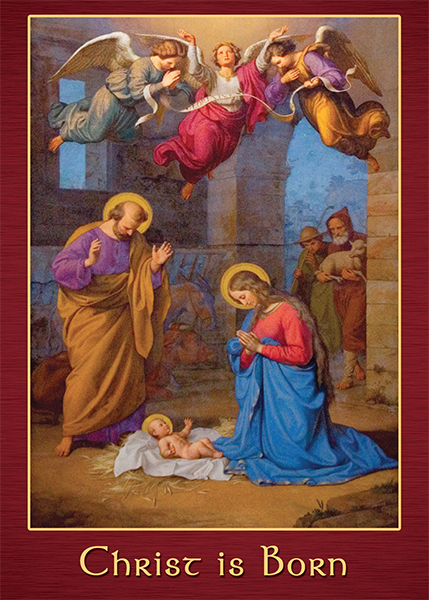 This year, we updated the card to give it a beautiful linen-textured background and words proclaiming Christ’s birth. Visit our Christmas cards page to have a closer look at the covers and view the inside greetings. If you send out a lot of Christmas cards or want to stock up for future years, take advantage of our bulk discount, which begins with orders of 15 sets. Contact us for more details before placing your order so that we can create a customized invoice. 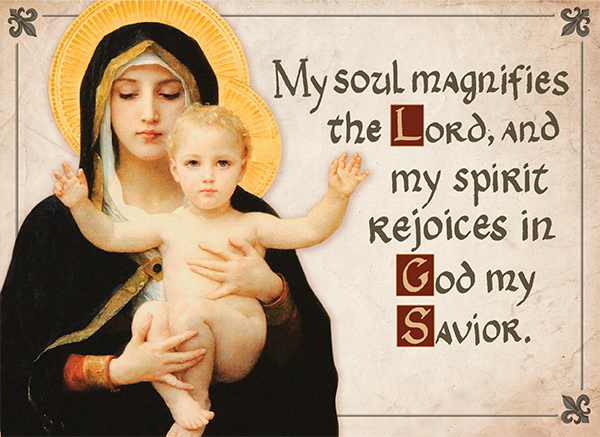 This entry was posted in Latest News and tagged A Child is Born, Christmas cards, Magnificat, Nativity. Bookmark the permalink.